Moonen is undertaking a significant refit of the Moonen 84 superyacht Impetuous. 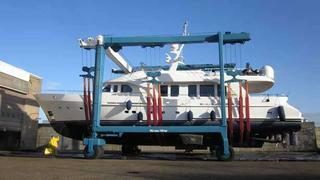 The 26.3m yacht is the former Phoenix, which was bought last year with the intention of refitting her. The project has been commissioned by an owner who knows the Dutch Moonen Yachts yard well, having had two new Moonens delivered in 2003. The project involves a considerable amount of work and will include the extension of the swimming platform by one metre and the installation of a zero speed stabilisation system, new teak decking. The seating area on the flybridge is being enlarged and rearranged. Inside the boat, the existing owner’s suite and one of the guest cabins will be replaced and two new guest cabins will be installed. The galley, currently part of the saloon, will be transformed into a separate area, while the audio/video facilities in both the guest and crew areas will be modified and renewed. The refit also covers comprehensive maintenance of the technical installations and an upgrade in noise attenuation. The existing shore transformer will be dismounted and a new 50 kVA converter installed in the engine room. In addition, all navigation and communication equipment is being reviewed. Lastly, Impetuous will have a new tender and exterior paintwork. The Moonen yard is also undertaking a second refit project, of the 30 metre Amigo, originally built by Heesen in 2001 to a Peter Beeldsnijder design.